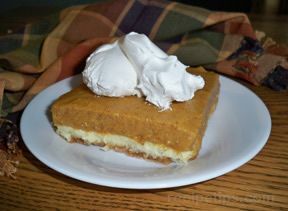 If you like pumpkin pie, you'll love this fantastic dessert layered with a nutty graham cracker base, sweetened cream cheese, and a smooth pumpkin filling, all crowned with creamy whipped topping. In a medium bowl, mix the crumbs, walnuts, sugar and cinnamon together. Stir in melted butter until all is moistened. Press into an ungreased 13x9 baking dish. In a large mixing bowl, beat the cream cheese until smooth. Beat in a sugar and eggs until fluffy. Pour over the crust and bake at 350 degrees for 20 minutes or until set. In a large saucepan, combine the pumpkin, egg yolks, 1/2 cup of sugar, milk, cinnamon and salt. Cook and stir over low heat 10-12 minutes or until mixture thickens. In a small saucepan, sprinkle gelatin over cold water, let stand for 1 minute. Over low heat, stir the gelatin until it is dissolved completely. Stir in the pumpkin mixture, allow to cool. Beat the egg whites, with the remaining 1/4 cup of sugar until stiff peaks form. May not get real stiff but will become thick and glossy. Fold into the pumpkin mixture. 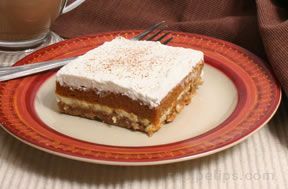 Pour pumpkin mixture over the cream cheese layer. 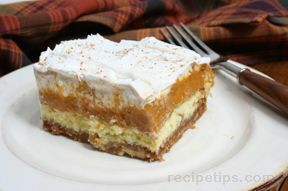 Top with a layer of whipped cream topping. Refrigerate for at least 4 hours or until completely set. "I made this torte AFTER Thanksgiving because my Grandmother makes a version of it every year and I just LOVE it, needless to say I wanted more. So, I found this recipe which sounded closest to hers and I was NOT disappointed!! This torte is totally delish and SO close to my Grams' that our whole pan is almost gone, and I made it yesterday!! Definitely will be a staple at every Thanksgiving from now on. Thank you so much for the recipe!" "I'm very surprised and disappointed that this contains raw egg white! I just got done with this very lengthy recipe and realized in the last step as I folded in raw egg white that I now won't be able to serve this on Thanksgiving tomorrow because there are two pregnant ladies attending! Very disappointed to say the least."